Wyoming Grizzly Bear Hunting Draft Regulations where released. We have been following this for some time and are pleased with the work put in to get these regulations out this year. If all goes as planned the first Grizzly Bear Hunt in Wyoming in over 40 years will take place this fall. We have studied the regulations and broke out the key points below. Please keep in mind that we are not out of the woods yet. These regulations will have to go up for public comment. After the comment period the Wyoming Game and Fish Commission will meet on May 23rd in Lander, WY to again review regulations and comments. It is at that time the regulations will be vetted by the commission and either approved or not. After all that is done we still have law suits sitting in the court systems right now that are challenging the de-listing rule that was sent down in 2017. This rule removed the Greater Yellowstone Ecosystem Grizzly population from the Endangered Species List. If selected off the list for the DMA hunt you will have a maximum of 10 days to purchase your tag at a Department Region Office or Headquarters. The department may allow baiting in hunt areas 7 and 8 if they determine it is necessary to meet harvest objectives. Don’t count on it!! Licensed grizzly bear hunters shall not take grizzly bears within one quarter (1/4) mile of Wyoming State Highways 22, 28, 120, 131, 296, 352, 353 and 390 or U.S. Highways 14, 16, 20, 26, 89, 191, 212 and 287 within hunt areas 1, 2, 3, 4, 5 and 6. There will be 2 different tag choices for applicants to choose from. You can only apply for one of these per season, not both. The Department will issue 75% of the licenses to residents before a non-resident license will be issued. So, the total available bears available for harvest in 2018 would technically be 24. That being said 24 harvests are highly unlikely. The DMA tags (Hunt Areas 1-6) operate a little differently than the non-DMA tag (area 7). The DMA harvest will be very restricted. Applicants will have to apply to be on a list. They will then be assigned a number. The Wyoming Game and Fish Department will then call the 1st applicant and 2nd applicant on the list. Those individuals will then have the opportunity to pay for the grizzly permit. They can then hunt any open hunt area located within the DMA which is comprised of hunt areas 1-6. If they should be lucky enough to shoot boars then they department will move to next two on the list and so on and so forth until the total quota for the DMA units has been met. So, the way this works is the amount of licensed hunters in the field at any given time shall not exceed the collective female mortality limit available. This is a safety mechanism. It ensures that at no time there are more hunters than females left in quota. This is crucial guardrail built in by the Department to mitigate over harvest of females. This is a very important piece to the sustainability of not only the grizzly bear in the GYE but the sustainability of our grizzly hunting seasons. If this number is breached it could jeopardize the de-listed status of the Greater Yellowstone Grizzly Bear. So, if the first two hunters on the list go out and each shoot a bear, 1 male and 1 female the department will only call 1 hunter off the list next as there is only 1 female left in the collective mortality. If the 1st two hunters out of the gate in the DMA shoot sows the season is over regardless of how many boars are left in quota. So, the 24 total is not guaranteed and highly unlikely. This is an important thing to remember when all those anti-hunters start chiming in on the total available bears in the harvest. Now the NON-DMA unit is much different. Hunt area 7 and 8 are outside the DMA therefore those bears are not actually counted toward the overall 3 state mortality quota. Let’s give you a little background on that. During the delisting process the 3 states in the GYE had to decide how they would manage the surging grizzly population. Due to the Recovery Criterion built in to ensure that the GYE grizzly bears never fall back on the list the 3 states had to determine how to manage the discretionary mortality of the bears within the GYE. In comes the Tri-State MOA (Memorandum of Agreement), a document that basically says how the 3 states are to manage their grizzly bears to ensure sustainability and healthy populations. This agreement also lays out many bears each state will be able to harvest within the DMA based on previous years mortality. The MOA does not actually have a number of available harvest, but a percentage based on the amount of the GYE that lies within each state. So, Wyoming has 58% of the DMA within its borders so Wyoming would get 58% of the total discretionary mortality. Montana gets 34% and Idaho gets 8%. So, if the available discretionary mortality is 20 going into the summer Wyoming would get 58% of the 20 tags, that would be 11.6 tags, Montana 6.8 Tags, and Idaho 1.6. Based on those values they then use another percentage to determine how many of those harvests can be sows. Each year this figure changes based on the previous year’s mortality outside of hunting. This is another guardrail built in to ensure the population is not depleted below target levels and ensure the management stays in the states hands. So why is this important when talking about the grizzly hunt area 7 and 8 you ask. Well those areas are outside the DMA, therefore the moralities in those units do not count towards the total quota and are not governed by the Tri-State MOA. 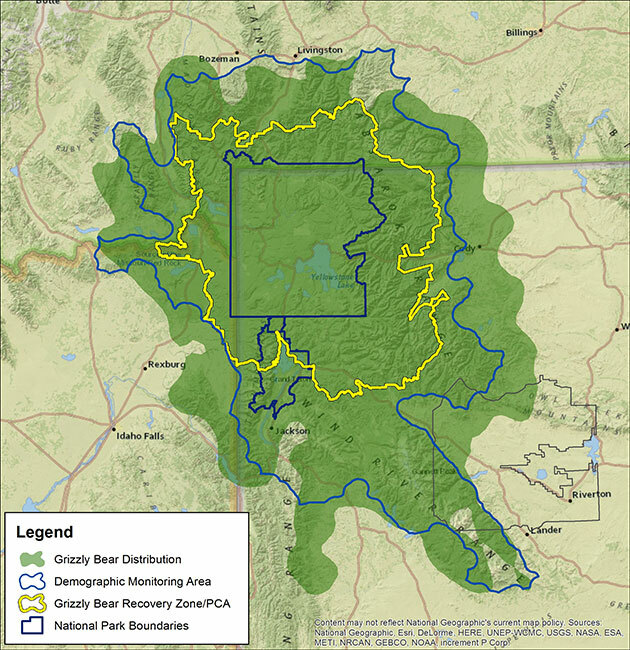 Basically, the states can do whatever they want with Greater Yellowstone Ecosystem Bears outside of the DMA. Wyoming decided they would allow 12 harvests in 2018. There is no female mortality threshold in these areas and it will not be closed unless the total quota is filled or the season ends based on closure date in regulations. Confused yet? Well don’t worry, we are here for you. We can absolutely help with any questions you may have. Remember, we are in the comment period right now for these regulations. It is imperative that you attend a public meeting to comment or comment online. We need as many sportsmen and sportswomen to comment in approval of at least the opportunity to hunt. While we all may have issues with certain points of the regulations let’s not let that overshadow the fact that we are in favor of a grizzly bear hunt regardless of restrictions. Thanks and here’s to you drawing a 2018 Wyoming Grizzly Tag! Thanks, and here’s to you drawing a 2018 Wyoming Grizzly Tag!